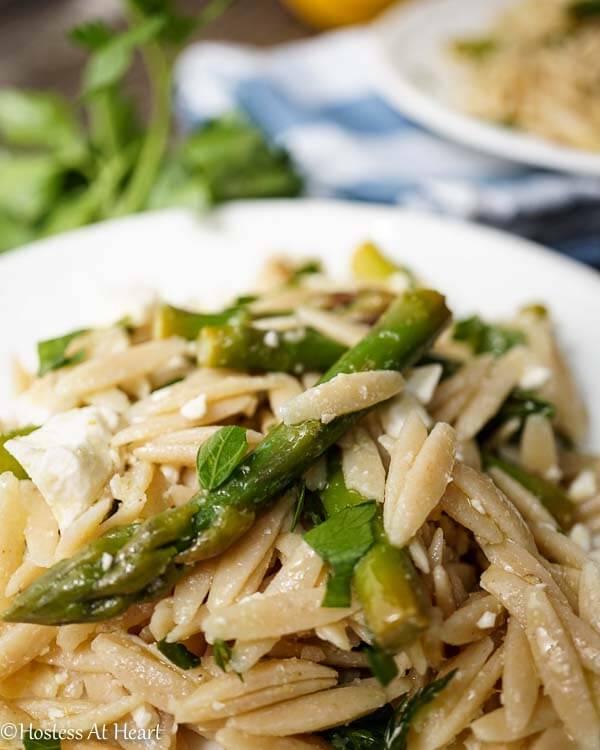 Asparagus Orzo Salad is an easy and delicious salad that is made with whole grain orzo, fresh lemon, crisp asparagus, and feta. It makes the perfect summer dish! Growing up, my dad owned the town tavern. He was gone most of my day and only had Sunday’s off. On Sundays, we often went fishing in nearby ponds. My mother always prepared a picnic lunch. She often made fried chicken and potato salad. I get hungry for it could just thinking of it. I think about those dirty little hands handling worms and who knows what, and I cringe. Oh well, none of us ever got sick. I still love potato salad, but John isn’t crazy about it (maybe he’s just crazy?) I also limit myself to salads that contain mayonnaise because of the fat. There are a lot of delicious salads that we do like, such as this Asparagus Orzo Salad, that is a bit better for us. This Asparagus Orzo Salad is chock full of great healthy ingredients. I used whole grain wheat orzo, fresh lemon, crisp asparagus and crumbled feta. This salad is cool, fresh and delicious. It is perfect as a side at dinner or a picnic lunch, and it makes a huge bowl so make sure you have plenty of hungry people to feed. It also lasted for an entire week, and I never tired of it. Bring a large pot of water to a boil. Add asparagus and blanch for two minutes. Remove with a slotted spoon to a sieve or colander and run under cold water to stop cooking. Return the water to a boil, salt the water and add orzo. Cook for suggested time, approximately 9 minutes. Drain and run under cool water. In a large serving bowl. add orzo, asparagus, feta, parsley and lemon zest. In a small bowl, combine olive oil, lemon juice, salt, pepper, and yogurt. Whisk to combine and add to orzo combination. 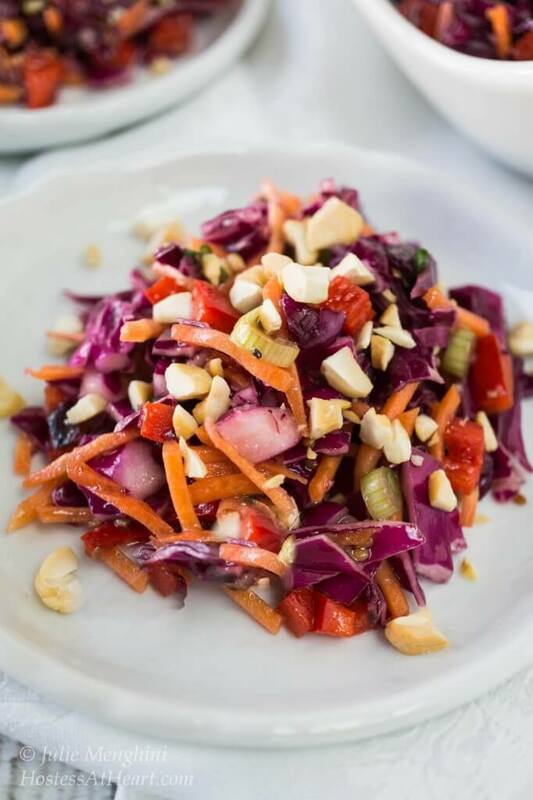 Are you still looking for a couple other amazing salad ideas? Here are a few of our favorites! 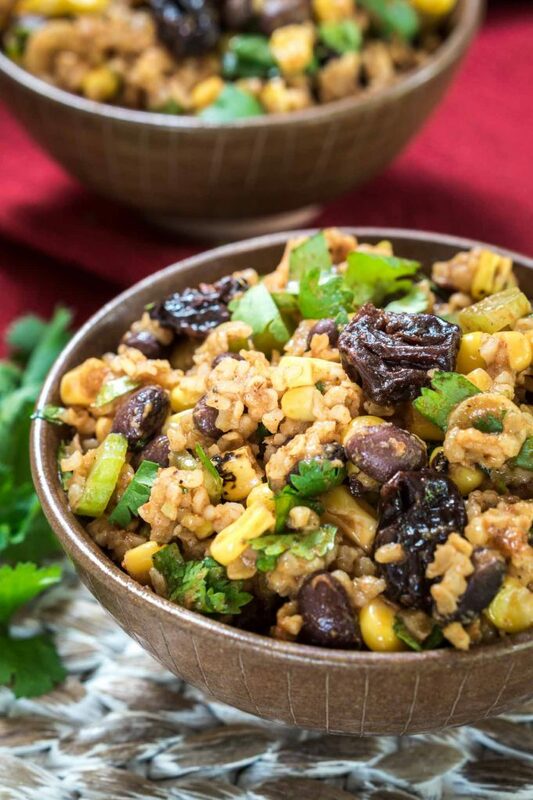 Orzo is one kind I have never tried before.. the recipe sounds so summerish and delicious!! Thank you Sonal! Give it a try it’s really yummy! Thank you, Roberta! Malta is on my bucket list and that dish you had sounds absolutely amazing. Have you remade it? I would love to dig into it myself. I love all those goodies on a salad. No I haven’t unfortunately. It’s been always on my list but I never got round to it. Now I have yours though which I will make very soon. I’m hosting a BBQ very soon with friends and I’m sure this lovely recipe will be an instant hit! Thank you Roberta! Enjoy your weekend and have fun at your BBQ. I love hosting them too. Orzo is so wonderful, but I don’t use it often enough! Maybe this will get me to cook the orzo I have in my pantry! Although I haven’t seen asparagus in weeks. Fabulous salad! I love it, especially in cold salads. I’m with you though I don’t think to use it more often. I’ve been way to lazy this summer! I love this recipe, Julie! Orzo is one of my favorites, I think because of the texture, and my husband and I both enjoy asparagus. And feta makes everything better as far as I’m concerned. Yummy recipe – thank you! Pinned to make soon. Thank you Shari! It will be a repeat at our table too! Perfect for warm weather. I hope you will let me know if your enjoy it. Thank you for stopping by! This salad looks so yummy Julie, perfect for summer – I definitely need to try it, I’m a bit of an asparagus fiend haha! I think we worry way too much about germs these days, a little is good for ya! Thank you Michelle! I remember when kids eating dirt was normal. Ha! This looks and sounds delicious! Healthy too 😀 And I LOVE that this salad doesn’t involve vinegar (although I think I’m the only one I know who dislikes vinegar). Thank you! My husband can’t stand vinegar either! What wonderful memories! Fried chicken, potato salad, a fishing pole and time with your Dad. Perfect. Recipe sounds great and wonderful summer food. Thank you Liz! I have a lot of those old fashioned memories. A time that kids ate dirt and it was normal. 🙂 Enjoy your day! Thank you Jhuls! It is a keeper in my book. Happy FF to you too! Thanks Judi for hosting us this week. I signed up for my first hosting job. I’ve never done it so hope it isn’t too time consuming? This salad is so good. It’s going to my go to for pot luck since it makes so much. You will enjoy co-hosting Julie. It’s a matter of reading as many recipes as you want and commenting; some only do half – like you would take the odd numbers and the other co-host would take the even numbers. Others, like myself, comment on all of the posts. The hard part is choosing as there are so many good ones. You pick 4 or 5 favorites and tell Angie why you like them and then she makes the final decision and includes your reasons. You are very into the social aspect of blogging so you will make a great co-host. Thank you Judi! My husband would kill me if it was something that tied me down all weekend :). Hey Julie! What a great looking summer salad. 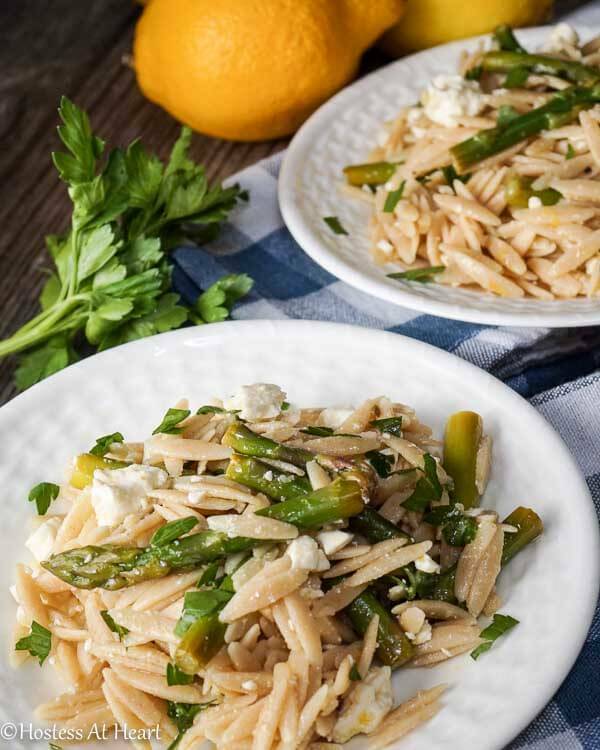 I love orzo and the lemon and asparagus is a great pairing. Great story about your family. A little worm guts and dirt never hurt anyone. Have a great weekend. :)). Not sure about Orzo, but love asparagus. Thank you Lili! Not sure what it is or if you like it? Orzo is just a small pasta. 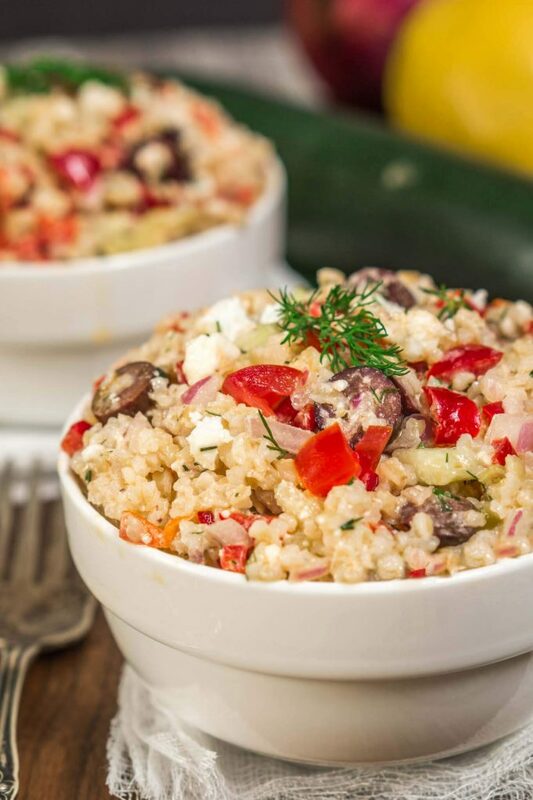 You could use another pasta or even a seed like quinoa or a grain like farro? Helathy and tasty sald .. Yum yk. Thank you Loretta! I used whole grain wheat orzo so it is a little bigger than traditional orzo. I was also very happy with these pictures. It was the perfect time of day which doesn’t happen all that often as we know. I look forward to your email! Thank you Sarah! I hope you will be as pleased as we were. Great salad Julie, I love orzo, it is just as good served hot as cold and when mixed with the asparagus and cheese makes for a wonderful side or meal for that matter. Your memories of childhood are sweet, I used to go fishing with my Dad also and foraging in the forest for mushrooms. My Dad loved the outdoors. Such lovely memories. Thank you Suzanne! As children, we preferred to be outdoors. It always amazes me how food and the social aspects of it form our memories. Good ones for me! What a perfect summer salad. I love the tender crisp asparagus too and your recipe brings so many favorite flavors together. Thanks for sharing it. Thank you Sandhya! I just can’t get enough of the wonderful asparagus that’s available right now. This looks so fresh and delicious! My boyfriend would love all of the flavors! Thank you Dani! It is all of that, and we really enjoyed it. I’ll make it for a summer potluck next time because it makes so much. I appreciate your stopping by! This looks like a perfect summer salad filled with everything l love! Great new graphics too Julie! Thank you Johanne! It really is a light flavorful side. I just love al dente asparagus! This sounds super delicious. I am OBSESSED with asparagus right now, so I pretty much enjoy eating it with anything and everything. Thank you Hannah! I am with you! As soon as new produce arrives, I can’t get enough of it. I am crazy for al dente asparagus in everything. Thanks Debbie for pinning! I just love potato salad too. John doesn’t like mayonnaise or ketchup! He’s lucky he has a few other attributes I’ll tell ya.